So for you who are not aware, Urban decay have collaborated with Gwen Stefani and brought out 4 products; lip liners, lipsticks, blush palette and eyeshadow palette. The one I have my hands on is the eyeshadow palette and will be giving a review for you today. Firstly this palette retails for £40.00, which is the average price for the urban decay palettes. 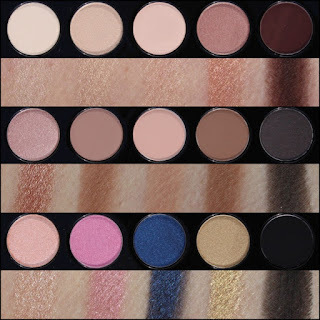 Within the palette you get 15 shades a mixture of mattes and shimmers. 12 of these shadows are ones Gwen has created herself and 3 are from the original in the urban decay collection. Can we just take a minute to wow over the packaging, isn't it beautiful! Bonus there is a huge mirror inside! There is so many looks you can do with this palette and even those pop of colours are brilliant as liners! This eyeshadows are just like the rest of urban decay eyeshadows, buttery, pigmented and blend like a dream. This palette certainly doesn't disappoint! So if you are wondering whether to take the plunge are purchase it, GO for it!